Power sensors are one of the most versatile, broadly used RF and microwave test devices. Many engineers consider the power sensor a basic device that simply measures RF power levels. However, modern technology has added many new features to these seemingly simplistic devices. In this article, I will discuss some of these features and how they can be used to make faster, more accurate measurements. The first responsibility of a power sensor is to be accurate. These devices are often used as calibration standards for other equipment. Network analyzers, spectrum analyzers, sources, transmitters and many other devices must have accurate, traceable calibrations. Quality power sensors will have first tier traceable calibrations from a recognized standards laboratory. Laboratories such as NIST, the National Institute of Standards and Technology, run by the U.S. Department of Commerce, or PTB, the National Metrology Institute of Germany, should be expected. Use of the term first tier indicates that the customer’s sensor was calibrated and verified using calibration standards that were directly calibrated by the recognized laboratory. This assures the highest accuracy available. Power meter and sensor terminology has caused some misunderstanding of just what a power sensor is. Traditionally, a power sensor or head was a simple detector or detector system with a chopper/amplifier, and with a high degree of RF engineering. The power head’s detected signal is fed to a meter device in an analog form where it is further processed for display. In this case, both the meter and sensor require calibration. Most modern, self-contained sensors have adopted the term Power Sensor; however some manufacturers use the term Power Meter for their USB sensors. Further adding to the confusion, some power meters act as user interfaces for USB power sensors. These USB sensors can be used with a computer or the company’s power meter. This difference is somewhat hidden from the user. The compactness and flexibility has also helped keep the USB power sensor at the forefront of modern design. 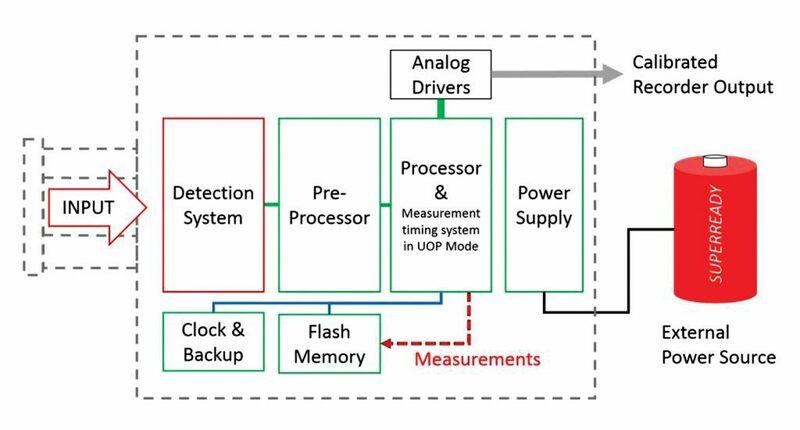 Some engineers consider traditional power meter and analog sensor technology to be the most accurate system; however, the added connection between the meter and sensor adds a level of uncertainty and instability. Even after the required calibration and zeroing before use is complete, the system will drift. With modern, self-contained USB sensors, the entire measurement processing path, including digitization, is managed in one instrument, eliminating components and reducing instability, drift, and other uncertainties. The added benefit of modern components and new design increases overall performance further. In the recent past, development and engineering investment has shifted from meter-sensor combinations to self-contained power sensors. This engineering investment, along with new processing and measurement components and technologies, has led to the introduction of compact power sensors with new, unique features unimaginable just a few short years ago. Current USB power sensor designs are as accurate as, and in most cases more accurate than, meter-sensor combinations. Further, these power sensors do not require a meter with a separate calibration, allowing for an all-encompassing calibration. 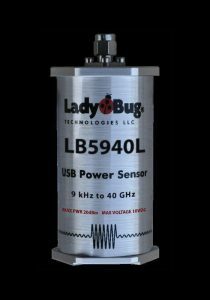 The LadyBug LB5940L Power Sensor shown in Figure 1 is fully self-contained; all corrections and calibration data are processed inside the sensor. This leads to less calibration uncertainty because the full measurement system is calibrated together in one device. No external meters or controls are required to make fully calibrated measurements. The measurement capability of new, state-of-the-art power sensors has increased dramatically. Multipath diode-based power sensors offer very high dynamic range compared with meter-sensors and early USB devices. Diode-based sensors offer extremely fast measurements, some capable of simultaneous pulse and True RMS measurements. Fast, diode-based sensors offer frequency ranges that are very broad. For example, the LB5940L self-contained Power Sensor shown in Figure 1 provides accurate, seamless True-RMS power measurement from 9 kHz to 40 GHz. The two-path sensor has greater than 80dB of dynamic range as well. Modern components enable size and performance advances in other areas. In many self-contained sensors, analog switching is employed between the measurement paths so that the expensive analog-to-digital converter can be shared. This, however, causes range switching issues and can make measuring anything other than average power very difficult. Figure 2 shows the signal processing from a typical first-generation USB sensor. Sensors of this design are still sold today. As can be seen from the diagram, the analog signal is fed to the analog to digital converter by a switch. This design reduces cost and power consumption. One downside is that ranging must be utilized to select the best measurement path. During the auto-ranging process, the signal is applied and the sensor switches between the measurement paths to locate the signal level, then sets the best path. Hysteresis is employed in the region where the two paths are both capable of delivering a measurement. This design is not ideal, with certain dynamic signals that lie within the path cross-over area and require both paths. In many cases, the manufacturer instructions “request” the user to specify an expected signal level, and the sensor uses this information to help make path selection. Further, the analog switch adds uncertainty to the measurement system. Simultaneous multipath signal processing was first introduced to USB power sensors by LadyBug Technologies, in 2005. The technology is now employed by other leading power sensor manufacturers in some USB sensors. This technology allows for a seamless measurement over the sensor’s entire power range without any path selection. As faster detection schemes are introduced, this technology’s benefits become clear. For example, if a fast detector is employed, many aspects of a pulsed signal that lies within both measurement paths can be measured without issue. New sensor designs such as the LB5940L, shown earlier, utilize simultaneous multipath processing plus other advanced schemes. For example, as shown in Figure 3, this sensor design includes a pre-processor to handle the data arriving from the A/D converters. This allows for very fast collection of measurement data and relieves the primary processor of certain tasks so that it can perform other functions more efficiently. The system also allows for advanced trigger mechanisms, including accurately timed gates with very small time increments. Because accuracy is such an important part of a power sensor’s job, zeroing and calibration prior to use must be addressed. Until recently, all high-accuracy power sensors required external zeroing and calibration prior to use. The introduction of LadyBug’s patented no-zero no-cal system in 2005, and the following inclusion of internal zeroing and calibration components in other high quality power sensors, has changed the zeroing and calibration requirements. The LB5940L sensor in Figure 1 measures accurately down to its noise floor with no user zeroing before use. Other sensors available in the market utilize internal zeroing systems to reduce zeroing requirements. Many of these sensors only require external zeroing for low level measurements, such as those below -30dBm, for example. Internal zeroing systems have the downside of interrupting measurements to perform zeroing periodically. Internal zeroing capability is also limited by switch leakage on most sensors with a high dynamic range. LadyBug’s patented no-zero no-cal system eliminates all of these issues and never interrupts measurements. In any high dynamic range RF & microwave instrument, temperature stability is a driving factor for design and usability. Test systems are built up using multiple instruments that are designed with the highest possible dynamic range and sensitivity, including power sensors. Each of these different instruments have their own temperature issues that must be individually managed so that the entire test system delivers a stable, satisfactory result. A change in one instrument in the system can make it necessary to recalibrate the entire test system. Advances in technology have improved temperature stability in many instruments such as power sensors. Many modern power sensors will stop measuring and recalibrate themselves when the environmental temperature changes. The assurance that your power sensor will re-zero itself when required can be beneficial; however, in a large test system, the interruption of automated activities can be problematic, particularly when it is unexpected. Some sensors such as the LB5940L sensor are fully characterized over their operating temperature range. These sensors do not interrupt measurements—they simply select new stored calibration data and continue to deliver accurate measurements. Advances in this area bring significant new usability to power sensors, including unattended operation. Unattended operation is a new feature to power sensors. 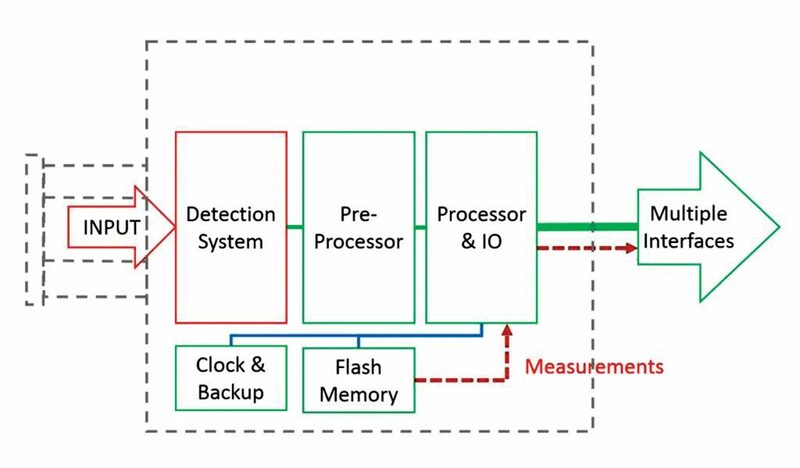 Sensors operating in unattended mode are capable of making accurate measurements and storing them in internal memory. Measurements are time-stamped using the internal real time clock. The option is easy to use. The user simply sets the measurement up and engages the UOP mode. These sensors can store 50 million time-stamped measurements in their non-volatile memory. The storage rate is up to 1,000 per second. As can be seen in Figure 4, the sensor only needs power to make and store measurements once set up and placed in the unattended mode. The sensor remains in its unattended mode when power is removed. When power is restored, the sensor simply starts back up and begins storing additional measurements. Memory is appended, not overwritten. The sensor backup system assures that the internal clock continues to function when power is not applied. The sensor can be powered by the USB cable or through the optional direct control interface cable. Unattended operation will make and store measurements while the sensor is connected to a computer if the user chooses to do so. If the Recorder Out option is installed along with the Unattended Operation option, it will function while the sensor is in unattended mode. With this set of options, users have available a high accuracy, calibrated analog output that is scalable. When the user is ready to examine the stored measurements, the sensor is connected to a computer. The measurements are retrieved from flash memory and returned through the USB bus. Figure 5 details the block diagram. The sensor uses USB power and user selectable blocks of measurement can be returned. Data will remain in the sensor until it is erased. The user can collect data and then return the sensor to the unattended mode, and add additional measurements if desired. Retrieved data is stored in CSV form and can be loaded directly into standard spreadsheet programs. Another area of significant advancement is connectivity. First-generation USB power sensors utilized a variety of interfaces, including communication formats with proprietary custom commands. Because power sensors are used in many test systems with a broad range of control software, flexibility in the user interface section, including the set of commands utilized, is very important. Today we are taking some liberty with the term USB Power Sensor. Many modern sensors are available with multiple user interfaces. Power sensors might have Ethernet, SPI and I2C interfaces in addition to their standard USB interfaces. Further, the LB5940L discussed here utilizes two USB interfaces to allow broad connectivity. The user can access USBTMC (USB Test and Measurement Class). This allows the sensor to drop right into many test systems with very little programming effort. Users familiar with LINUX and Windows programming may choose to use the USB HID interface. Since nearly every computer now includes system USB HID drivers, connectivity is easy. This sensor also offers direct connectivity using SPI (Serial Peripheral Interface) and I2C (Inter Integrated Circuit Interface). This option is ideal for users who are concerned about computer and USB reliability and choose to design systems with microcontrollers or FPGAs. The sensor’s functions are accessed directly without concern for enumeration buss timing. The user has complete control of the entire system and can access all sensor functions. This method of connection is ideal for small test “boxes” or systems where a power sensor is required for reasons of accuracy, reliability, and size. Other uses include self-contained point of measurement test systems, handheld test sets, and defense applications. Military security options are available in today’s power sensors. These options supplement sanitization procedures in defense and industrial applications where data security is at a maximum. For example, Option MIL for the LB5940L sensor removes the capability of the user to write any non-volatile information into the sensor. Each time the sensor is powered, it uses the factory default settings, eliminating the need for clearing any user settings prior to sanitation procedures. In addition to all of the new hardware features, new software capabilities include multi-sensor measurement calculations, loggers, charting capabilities, and analog meter display. New software also manages the hardware features, such as real time clock, unattended measurement retrieval, internal sensor preset storage and other functions. 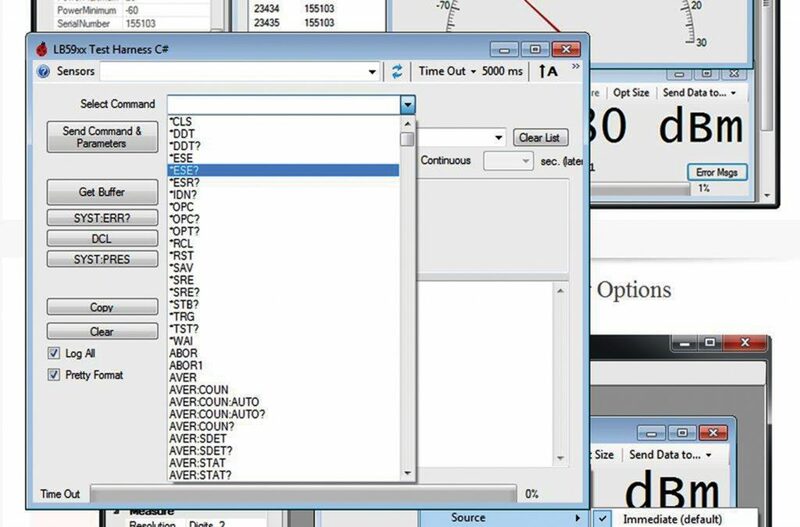 Some sensor manufacturers include Interactive IO software (Figure 6) that allows programmatic users to test all sensor functions with manufacturer-formulated commands, making ATE system development easier. Today’s power sensors take advantage of modern technology in many ways. Modern power sensors utilize fast, powerful microcontrollers and preprocessors that help them hone in on a signal’s finest details. The use of the latest passive technology helps to reduce noise, allowing increased sensitivity and greater dynamic range. Sensors are available with connectivity to almost any computer or controller. Flexible user software is included with most power sensors available today. These factors should all be considered when selecting your next power sensor. Orwill Hawkins serves as vice-president of marketing at LadyBug Technologies, Santa Rosa, Calif. He has over three decades of management, marketing, engineering and manufacturing experience, and extensive hands-on design and manufacturing experience in the RF, analog, and digital fields. Among the many products he has designed and marketed are a self-contained RF field disturbance burglar alarm system, a sailboat speedometer, and various robotic servo systems. Additional inventions include a prototype oscilloscope, a CNC cutting system, and various other analog, digital and RF projects.